How can I identify older people who may be living with frailty in my practice area? While frailty is not an inevitable part of ageing it is more common in older people. Of people over the age of 65 years, 10% have frailty, which rises to between 25 and 50% of those over 85 (Clegg et al 2013). The British Geriatrics Society (BGS) (2014) Fit for Frailty guideline recommends that older people should be assessed for frailty at all healthcare encounters. 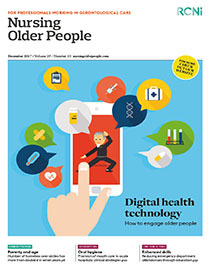 Share article: How can I identify older people who may be living with frailty in my practice area?